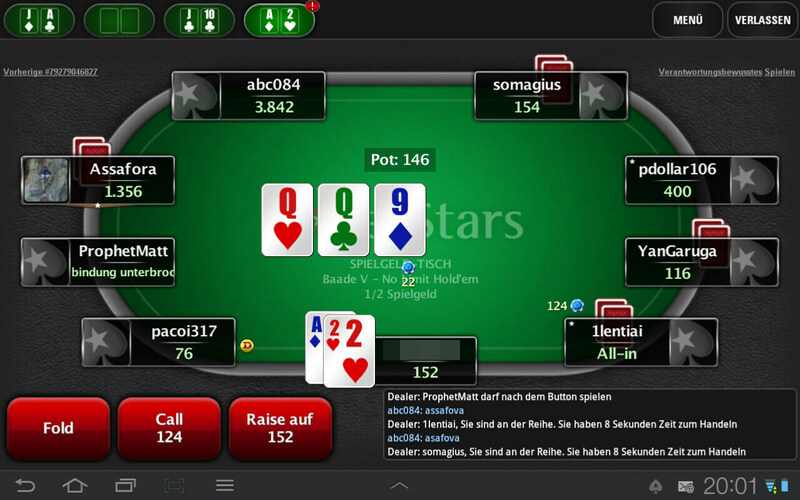 In 2012, PokerStars released its long-awaited real money App for iPad, iPhone and Android – and thereby delivered a masterpiece. Not only is the PokerStars App one of the few real money programmes that are available as a native iOS App in the AppStore (Android users have to take a detour, see below) but it’s also very persuasive when it comes to the App’s functional variety. Except for very few cases, all functions and games that you can find in the desktop software are also usable on iPad, iPhone and Android. There are tournaments, cash games also available in the highest stakes, Sit’n’Go and also Spin & Go and Fast Fold games – the market leader’s huge variety is also available in the mobile version. Up until now, experienced players, who manage to play six or more tables at the same time, could only laugh about many poker apps. 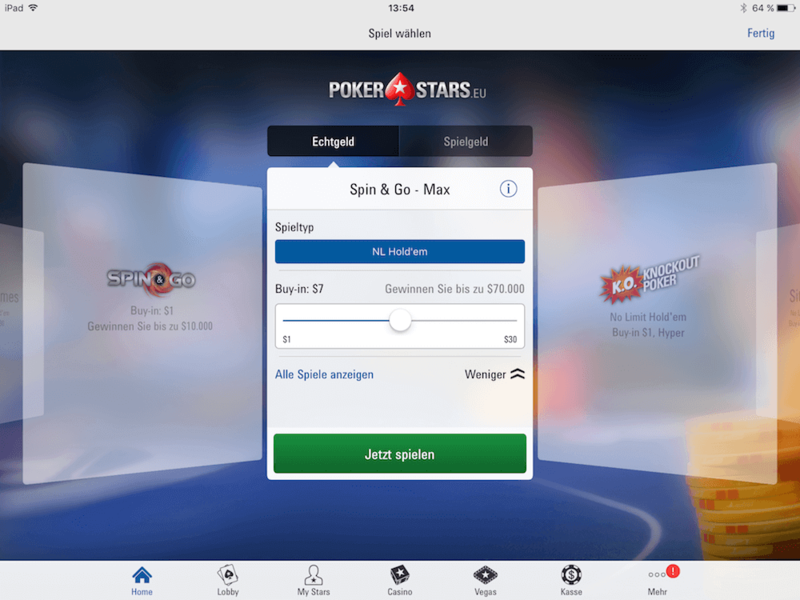 At PokerStars you can play up to five tables at the same time (iPad), however, it also offers the fast fold variant Zoom Poker, so that the mobile App is basically just as good as the desktop client. This is how Zoom Poker works: As soon as a player folds his hand, he or she is seated at a new table within a split of a second and gets new cards immediately. Playing that fast gaming variant at different tables at the same time should also please frequent players, at least for the time they have to play poker on their mobile. With PokerStars Spin & Go, another interesting game has been added to the app lately. Here you have the chance to win big in a quick tournament with buy-ins staring at $1. Some of PokerStars’ latest games have not been added to the app but run as standalone apps, such as the free-to-play app PokerStars Jackpot Poker and the PokerStars Duel App. In 2017, PokerStars is not only the market leader but also a innovation leader. If you want to open up a new account, you should make sure to profit from the 100% deposit bonus of up to $600 and the $20 free No Deposit Bonus. What’s important is that you use the marketing code psp17870 when registering (see below for detailed instructions). When making a deposit, which has also been possible from your mobile device since autumn 2012, you have to use the code STARS600. See below for a step-by-step guide. 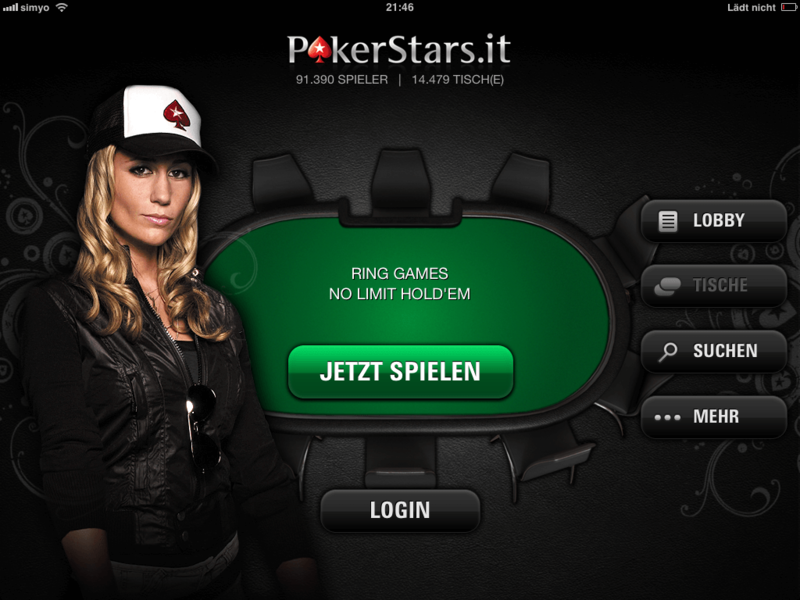 The PokerStars App is available for the two most important platforms iOS and Android – even as a native App. 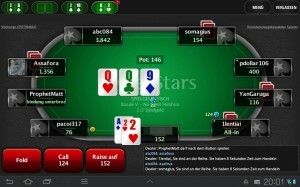 iPad- and iPhone users can get the PokerStars EU App by using a link on the mobile website. The same goes for the apk – just follow this link to PokerStars with your Android device and download the App there. How that works is explained in detail further below. Though the App is also available in the Google Play Store, it only provides the .net- variant without real money games. 1. PokerStars offers $20 free just for registration. Simply use the marketingcode psp17870 upon registration to qualifiy for the free bonus. 2. Players have 90 days to unlock their bonus, which is pretty generous compared to other poker rooms. 3. The $600 can be split up on up to three different deposits. This way, you can make a small deposit and try the App. If you like the poker room and the app, you can then get the maximum bonus by following two more steps. The marketing bonus for the best bonus is psp17870. Afterwards, when making your deposit you need to use STARS600. On top of that there is also the bonus programme, which allows you to get an additional cash back depending on your gaming frequency. On the lowest levels players get 12% rakebacks, at best it’s 74.45% mathematically. PokerStars is the world’s largest poker room and it’s known for its huge selection of tournaments, cash games and Sit n Go tournaments. With Zoom Poker, PokerStars offers an especially interesting fast fold poker version for mobile devices, where one is seated at a new table with new cards after having folded one’s cards. Here’s the good news: all games that are available in the desktop software are also available in the App for Android, iPad and iPhone. This goes for Texas Hold’em as well as for the gaming variants Omaha and Omaha Hi/Lo. Next to no limit there is also pot limit and fixed limit. In a nutshell: The PokerStars App has it all. We took off one point for the badly positioned fast fold button at Zoom Poker. When doing multi tabling it happens time and again that you accidentally fold the wrong hand. The App is updated regulary. Most of the times the new version brings several bug fixes and smaller improvements in layout and/or gameplay. But sometimes the mobile PokerStars client comes with a completely new feature. We keep this review up to date and write down the most important PokerStars App updates. August 2017: With Spin and Go Max, PokerStars added another variant of the popular Spin & Go Game. Unlike the original version, at Spin & Go Max a random number of players takes part in a single game. And once a given number of hands is played, all players go All-In until the winner is determined. He then has to choose between three different prizes. Will you be lucky and grab the big pot? In November 2016, PokerStars introduced the Beat the clock tournaments. These quick games were tailored for people that are short on time – and therefore they were implemented into the mobile PokerStars App for Android and iOS right from the beginning. But, after only eleven months, PokerStars decided to kill the game. It was taken from both, Desktop and Mobile, in September 2017. 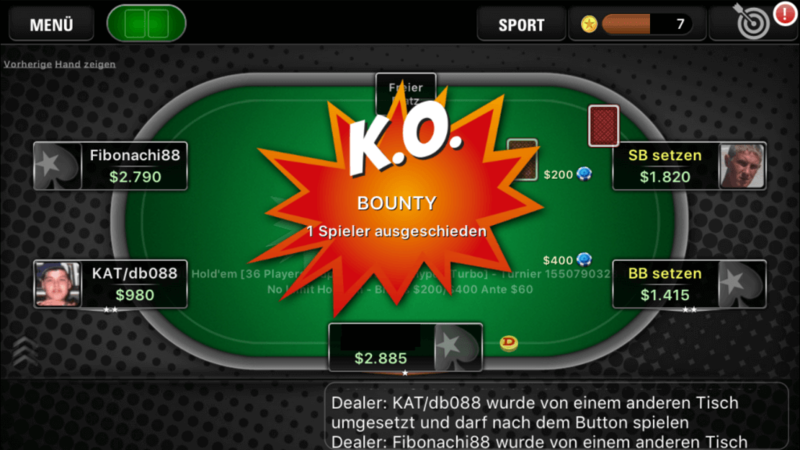 In Spring 2016, PokerStars added the thrilling KO poker games to the mobile App. These knockout poker tournaments are quick MTTs with a seperated price pool. Half of your buy-in (minus fees) is paid out to the best players at the end of the KO poker game. The other half is used for bounty. Every time you kick another player out of the tournament, you will get his bounty paid directly into your player account. We have played quite a lot of KO poker lately and like the game very much. Another thing that has been added lately are poker variants. On top of the Omaha and Limit games mentioned above, you can now play 7 Card Stud, Razz, Courchevel, HORSE and other poker games on your mobile device. Also, the new PokerStars Casino and BetStars has been fully integrated into the App. You can now switch between Poker, Casino and Sportsbetting without having to change the app. A great feature, especially for those of you who prefer some variety. 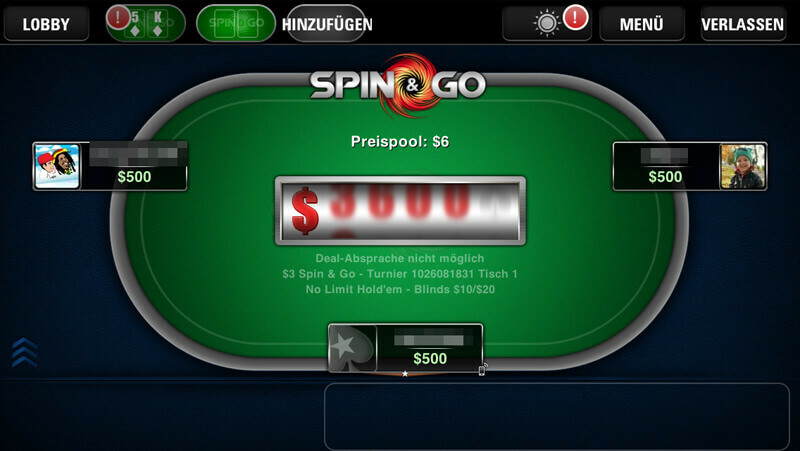 In autumn 2014, Spin & Go was added as a new gaming variant to the App. Spin & Go tournaments are super fast tournaments with only three players where you can multiply your buy-in within only a few minutes. Offering that fast, exciting and entertaining game is definitely a gain for the PokerStars App. Visually, the App is great. Due to the fact that – in contrast to many other competitors – PokerStars offers a native App from the Appstore and not an html5-App, complex designs and animations are not a problem. On the home screen, Rafael Nadal or Liv Boeree are welcoming the poker players. Overall, the App appears to be well-engineered and appealing. The poker tables are well arranged. All in all: top! There, again, the PokerStars mobile App scores well. Obviously, there is no reason to complain when it comes to the number of players, since PokerStars is the market leader. But also the App itself is great when it comes to the speed. Smooth animations, a great performance via mobile telephony and last but not least multi tabling make sure that even those who like to play as many hands as possible are pleased. You can play up to five tables simultaneously on your iPad. Even more hands per hour are possible, if you play Zoom Poker at up to five tables. There surely won’t be any waiting time. You either love or hate PokerStars. For many it’s a love-hate relationship, somewhere in between. What’s for sure is that on the one hand there are many newcomers due to PokerStars’ TV coverage, which leads to a great fish potential, but therefore also increases the chance of unpleasant bad beats. On the other hand it’s exactly this high number of inexperienced players that attracts good players. All in all, this is a promising but also risky mixture. UPDATE: Meanwhile, the registration process has gotten a lot easier: Just follow this link with your iOS or Android device. Your tablet or smartphone will be recognized and you’ll be shown the correct download link for the PokerStars App automatically. 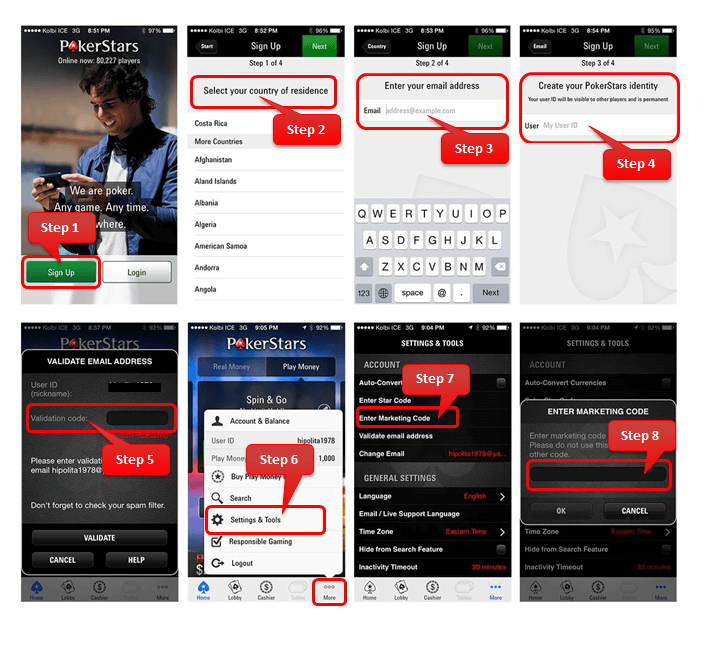 Step by step: This is how you open up an account in the PokerStars App and enter the marketing code psp17870. 1. Keep in mind the marketing code psp17870 – by using this code you can get yourself the currently best bonus of $20 free plus up to $600 during the registration process. 2a. If you’re reading this article on your desktop or notebook, click here in order to get to the registration website, download the desktop software and register at PokerStars. Once you’ve registered and followed either step 2b or 2c you can get going right away. 2b. iPad- and iPhone users get registered within the App: this is where you find the download link for your country’s Appstore when visiting the PokerStars App website with your iPhone or iPad. 2c. Android users can download the .apk here directly and register within the App. You have to activate the installation of external contents on your Android smartphone or tablet, since the App is only available as a play money version in the Google Play Store (Google doesn’t allow real money apps in general). 3. Now you can get registered directly within the App, in case you haven’t got an account already. First of all, when being in the App click on “Login” and then on „Create account„. When doing our test with the Samsung Galaxy Tab we’ve noticed that when using the keyboard in the horizontal format it’s often disturbing. However, when using the upright format it works just fine. 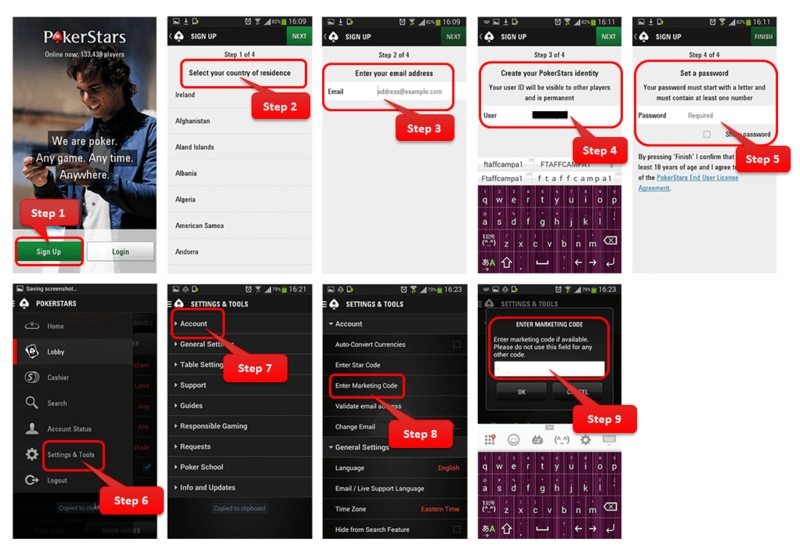 This is what the account creation looks like step-by-step on an Android smartphone. Enter psp17870 where it asks for a marketing code. 4. Before you can start playing you have to confirm your email address. This is possible in the App as well, even though PokerStars has hidden this function. Just click on “more” and scroll forward in the menu until you come across the point “confirm email address”. There you enter the numerical code from your confirmation email. 5. After you finished the registration process you’ll have to enter the marketing code psp17870 under settings & tools, which gets you the currently best bonus ($20 free and another $600 in total for your first three deposits, click here for all details). The input field for the marketing code is hidden under “account”. Enter psp17870. 6. In case you’re sitting in front of your PC, Mac or Notebook, you can also open up an account using the desktop software. Just follow this link. Here again, you need to enter the marketing code psp17870 first and use the code STARS600 when making a deposit. 7. If you want to play real money poker you now have to deposit money in your account. Meanwhile, you can do this from your mobile device as well. The cashier is integrated directly within the App so there’s no need to download the web cashier anymore. You can use Netteller, credit card, Skrill, Sofortüberweisung, Maestro, Entropay, paysafecard and uKash. Click here to get more bonus information. You can now also make withdrawals by using the PokerStars App.